It Is But A Matter of Course……Isn’t It? 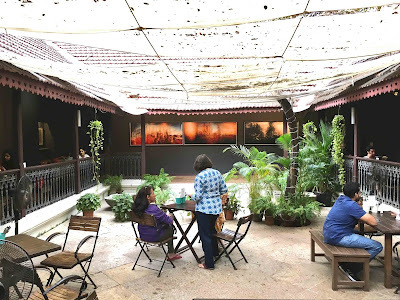 'Sensorium' - the end is only the beginning, was a multi-gallery presentation at Sunaparanta Centre for the Arts, a non-profit arts initiative founded by Dipti and Duttaraj Salgaonkar. Sometimes, Viewing art can be akin to a pilgrimage, and this exhibition certainly took me into deeper reaches of one’s existence and beyond. The last time I’d visited the centre was months ago and I had never driven there before. As luck would have it my maiden attempt was confusing and disorienting because the Jio Wi-Fi dongle acted up. And when I did have signal, google map was confused by the on and off signals such that I was taken on a long and needlessly winding route. When I finally got there, the painted blue and white facade was indeed a welcoming sight. Located atop Altinho Hill, Sunaparanta overlooks the city of Panjim and you can also catch a glimpse of the Mandovi River. 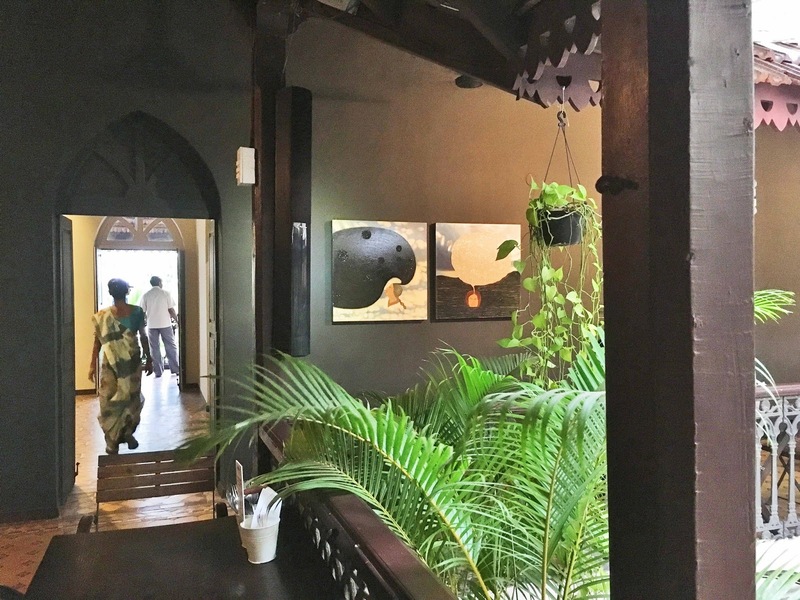 The arts centre is housed in a large Portuguese-style villa with lush foliage and flowers overhanging the entrance and courtyard. As a venue for compositions pontificating the concept of that which doesn’t have an end, but is just another beginning, this colonial bungalow showcasing contemporary art, was an apt location, in more ways than one. After seeing some of the art, sipping a cup of Earl Grey tea at the Bodega Cafe housed in the inner courtyard, I mulling over the works seen, I couldn’t help but notice how alluring Dhruvi Archarya’s, canvases, expressive of her inimitable wry humour, appeared, when framed by green Areca fronds in the foreground, and bordered by the undulating edge of a traditional, Khaprael-tiled, darkened terracotta roof above. 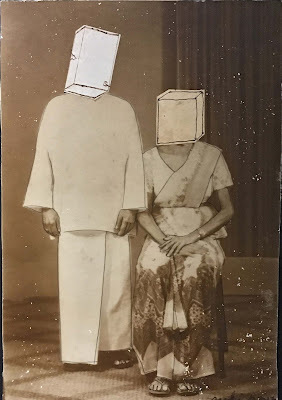 Desmond Lazaro’s polaroidic images, musing on family and personal history, glanced over my shoulder as I relished a slice of carrot cake, as if nudging me to talk about my own. Standing up to take a closer peek at the framed images, shadow-like lines of the courtyard and it’s various surfaces were reflected on the glass. It made for a rather pleasing juxtaposition, however unintended this may have been. In the gardens, at the entrance to the centre, Riyas Komu had constructed an ode to his father’s balcony in Thrissur. Chancing upon this oddly styled sculpture-installation at the very start was bewildering. It was only after I’d seen the rest of the works that, I was able better to appreciate its facets . Seen from different angles it took on varied shapes, where the contours got distorted or enhanced. 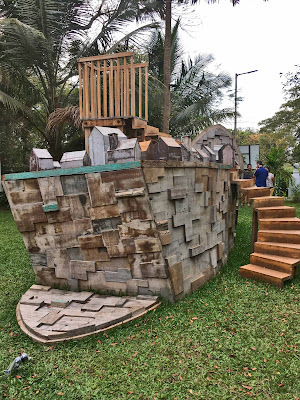 Although the artists intent was to enable spectators to experience their immediate surroundings through an altered perspective by climbing up onto this “ideological balcony”, I was more fascinated by walking around and noting how the model was re-crafted from each observed point. Created with metal and recycled wood the isolated balcony seemed to stand on its own. The structure that surrounded it and from which it rose above, was a crudely built house-like façade with a nave raised at one end and dropped at the other. This edifice used simple, monopoly-type house, ‘building’ blocks. Rusted metal crosses also made their appearance within this house of houses. All in all, it conjured a most curious tribute to a parent who was cited as a strong influence. 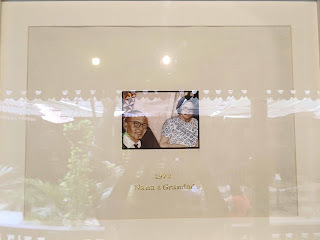 It was when I stood at the end closest to the bungalow (farthest from the entrance gate), where the nave was laid on the floor, and thought how it resembled a quirky ‘Noah’s Ark’ that, I got a sense of Komu’s relationship with his father and of his fathers’ relationship with the world: an embracing refuge, yet not built on this external validation, but standing on his own - powered by a potent inner self. My reading of this visage as a could-be Noah’s Ark, may well have been suggested by Gigi Scaria’s video ‘The Ark’. 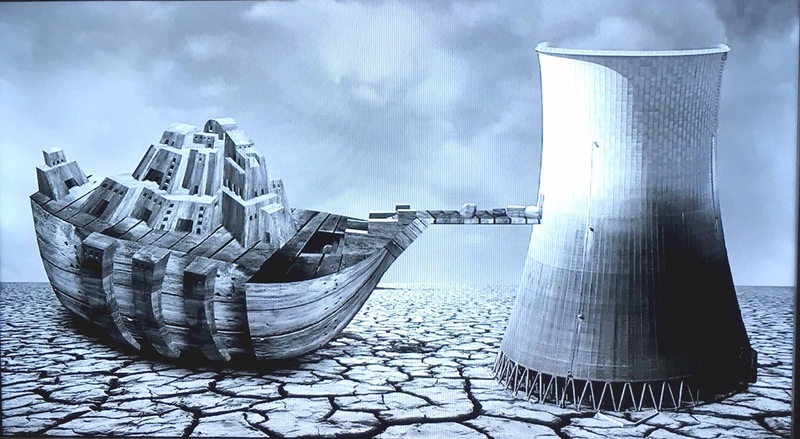 In this 3 minute, single channel black and white projection, Gigi takes us back to the biblical myth as “an abode of continuity in a terrain of utter destruction”. Shown on a relatively small screen, one was compelled to peer closely at the moving images watching a primitive, wooden, luggage-carousel-like-contraption, leaving the ark-ship which stands marooned on cracked, dry mud. This moving bridge enters a large chamber that’s spewing grey smoke. It struck me almost instantly as an asphyxiating gas chamber, evocative of what our polluted cities are becoming. I could only discern luggage as passing from the ark into this threatening space - were there no people, I wondered. And then, what’s the continuum? 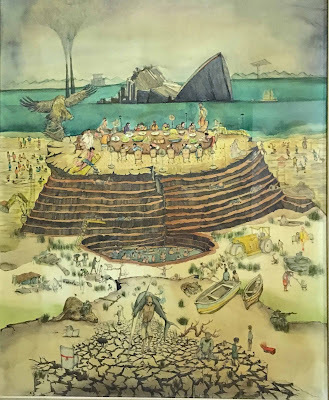 But, perhaps the artist suggests, that carrying forth untended emotional baggage, this is where mankind is headed - the end of the world as an envisioned reality? While using Noah’s Ark as a symbol of continuity (that life on the planet survived the engulfing deluge thanks to the rule that only two pairs of each kind could enter, to procreate and ensure continuity of their species), Scaria also refutes the impression that the end is a new beginning. He doesn’t see a continuance to the Ark and its implied notion of survival. Gagging with toxins, breathing the poisonous air of a crowded metropolis, it’s probably too difficult to imagine one. Numerous interesting works were on display, making untold demands on the viewing eye: Michael Muller from Berlin, Juul Kraijer from Holland, Julien Segard from France and Jacob Fellander and Pers-Anders Pettersson from Sweden, Iftikar Dadi from Pakistan in collaboration with Elizabeth Dadi from USA, Munem Wasif of Bangladesh, along with Belgium-born Srilanka-based artist Saskia Pintelon, made up the international quorum, while Indian artists from Jammu to Kerala, Tamilnadu and Bengal presented their work. 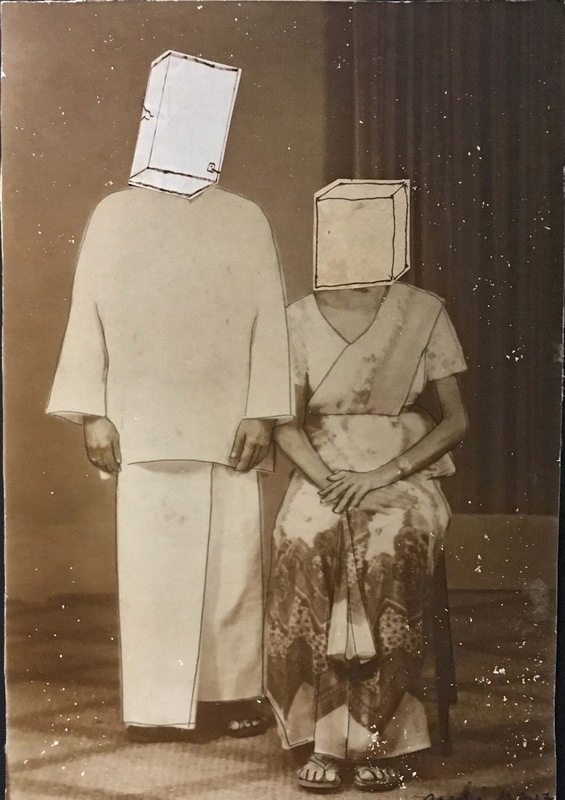 Reminding us of how mindlessly traditions are can be carried forth, Saskia Pintelon’s ‘Faces’ were inspired by matrimonial adverts in Sri Lankan newspapers. 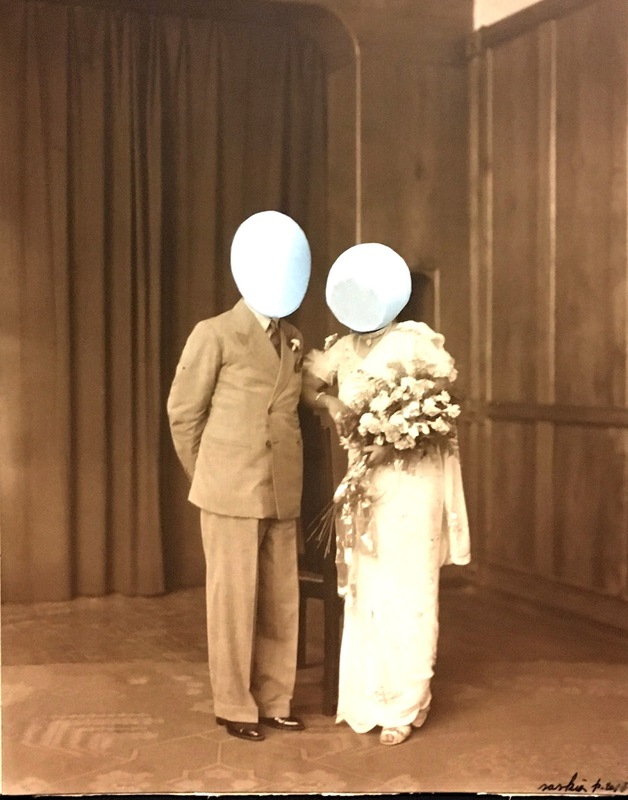 In series of collages with obliterated faces, (using smileys or empty egg-shells and other such interventions), she reworks old photographs (studio portraits), highlighting marital discord and the naivety of traditional choices. Above all, her comment resonates with the fact that traditions are kept in continuance, often without understanding the merit they were devised upon or for, or their relevance in contemporary times. Minimal, precise and incisive, Shreyas Karle subverts norms of perception. The two mirrored brass stairways of ‘Ascending Descending’ was quirky but it was the two brass pipes entitled '5mm' that compelled me delve deeper. What were those two parallel pipes depicting? If the simply presented visual hadn’t commanded attention, one could have missed the whole point. Intrigued by it, I glanced through the accompanying text and learned that the pipes were once of equal length, but one of the pipes had been cut into 6 parts and re-joined, which altered its size. The change is minimal and barely noted and the entire premise of cutting a pipe, joining it and placing the uncut and cut-and-joined bits, one above the other, seems almost absurd. But such works take art beyond that of visual delight, bringing into play psychological implications of parity versus identity and how a simple thought can alter this. At the physical level it’s an insignificant change. But, in an emotional capacity, and thereby the mental realm, what are the ramifications? How will this impact entities which once belonged as a whole or homogenous group, are separated by lines of caste, creed, religion, and then brought together as a single entity again? A seemingly banal play of ideas stimulates thought and debate. In a similarly abstracted and quixotic mould was Jitish Kallat’s ‘Rain Studies’. A unusual group of black and white drawings, denote ‘rain’ notations made by the artist when he stepped outside, during seasonal showers; holding the drawing paper skyward, turning them into unusual receptacles of rainwater. By virtue of the patterns formed on them by descending raindrops , these graphite and acrylic epoxy presentations on Arches paper become suggestive of planetary constellations. I’m uncertain of whether the undertaking was purely accidental and based on rainwater impacting drawings already done on graphite, if there’s a happy marriage of happenstance controlled by imaginative meanderings and how much of each is deliberately orchestrated, if at all. The initiative intrigues and highlights the potential of artistic endeavour to open up possibilities and creatively address issues of life, death, continuance. Where it is said to have all started with an astronomical explosion, by invoking the astronomical through the atmospheric, Kallat reminds us how energy destructed to recreate, paving the way for life as we know it. Suggesting that existing is but a ‘matter of course’, even if form and matter are reconstructed and re-formed, that the continuance lies in the life-force flowing into one altered form and the next. Thus revisioning age-old philosophies about past lives and reincarnation. There were many other presentations ranging from the very personal to political as well as abstract thought. 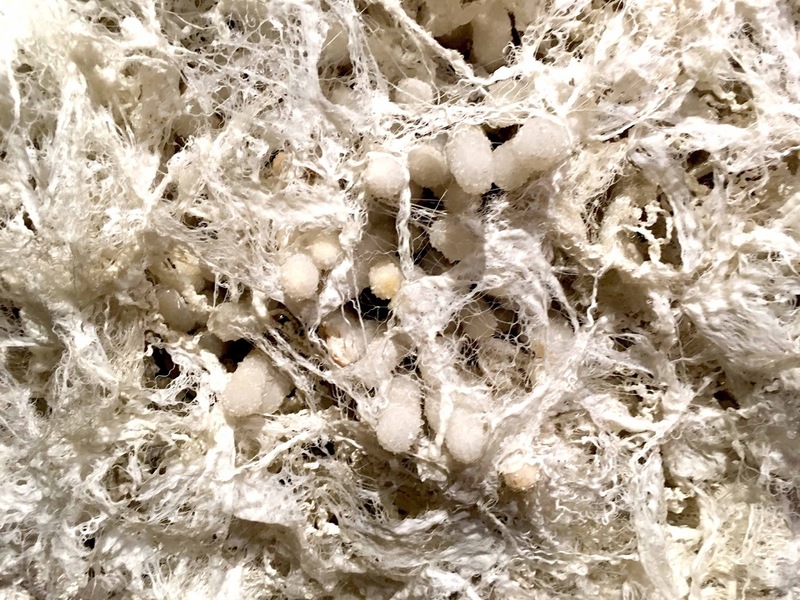 Parul Thacker’s ‘We Penetrate Deeper And Deeper into the Heart of Darkness’, was fabulously tactile and tempting to touch. Yet too chaotic and intimidating in its hard edges, to endear. 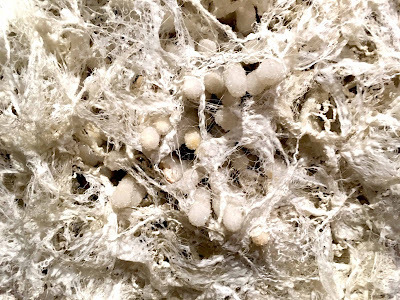 Exploring notions of eternal existence, through enmeshed monofilament fibres, raw cotton and phalanx-like, white stalactite crystals, a plethora of hardened crystal formed into phalluses of light, protruding horizontally from within the disordered depths of ‘symbolic chaos’, to suggest a continued existence through procreation. A simple, well-heeled opinion, most commonly held, was presented through the deeper, more abstract dimension of light - as the infallible, age-old wisdom of life. In his multimedia installation, ‘As He Takes From You, I Engraft You New’, Julien Segard touches on the codes of death and resurrection. He uses left-overs and fallen leaves along with plastic and other stuff that’s washed ashore. All of which he has picked up from a scrapyard in Panjim, and while walking the streets and shores of Goa. 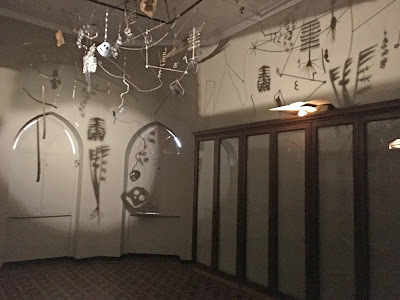 Delicately strung mobiles depicting skull bones and vertebrae among his other collected finds; hanging from the high ceiling of the dimly, but srategically lit ‘Library’ of the Centre, its not the engrafting of ‘new’ that shines through, but the concept of death is subtly reframed. From that which is traditionally enveloped by ghosts of despair, to an eerily playful event that, all which is born must face. The presentation is child-like and charming, belying the weightiness of a profound and philosophical theme. Carrying forward the haunted melody through surrealist photographs, Juul Kraijer suggests alternatives to conventional seeing. Two hands, laying one on top of each other, wearing netted gloves, don’t let you ponder on the beauty of those slender fingers, the quality or craftsmanship of the fabric. But, the gaze penetrates the physicality of form imaged, to fathom another, unstated, but decipherable dimension. It’s as if an underlying essence is being unmasked through tonal gradations, which emerge through a unique process employed by the artist. What you see, isn’t all there is to be seen. An invisible presence is felt. Placing her subjects under a cloak of darkness lends her images this sublime sense of unease which emanates from that which her subject experiences in the dimmed environment – not able to see, not able to centre, knowing she is being watched. Seemingly alone, she is not. And then, neither is the viewer, for the impression of what is perceived renders the perceiver self-conscious. Exploring another dimension of the seen and the apparent is Niyati Unnikrishnan of Kerala. 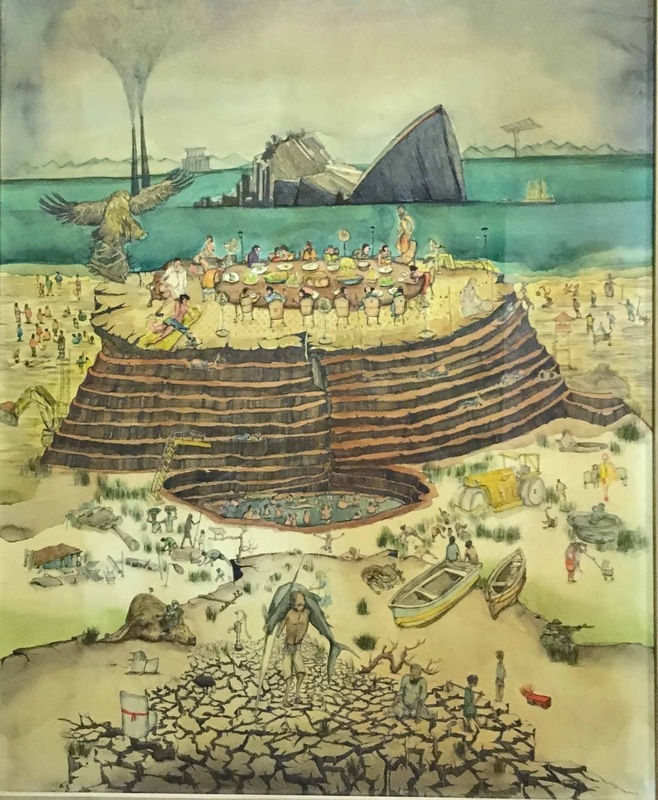 Tapping into a vibrant inner world, he presents fictional landscapes with the complexities that emerge in his engagement with current affairs, literature, art and the lives of the people he is acquainted with. In ‘Cake’ he brings together, sunbathing women, half-clad sadhus, yoga practitioners and socialites as part of the cake. They are seated on top, within its layers and in the surrounding scape. the soft contours of watercolour, pencil and ink on paper blur the edges of a satirical comment on the self and its counterparts in the external world. Where does it begin and end – who is who and what is what. Is it a cake or is it not? And is it the world we know, or is it not, or just an imagined space in the artist’s mind? The myriad questions that emerge, from observing this engaging dialogue of the inner and outer worlds with its apparently recognisable, figurative dimensions, lead into one’s own inner-scape. Bodega Cafe - Desmond Lazaro on right. The Sunaparanta Centre is a small and intimate viewing space. And each of the works were housed in what were once, rooms of sleep and leisure in someone’s home. 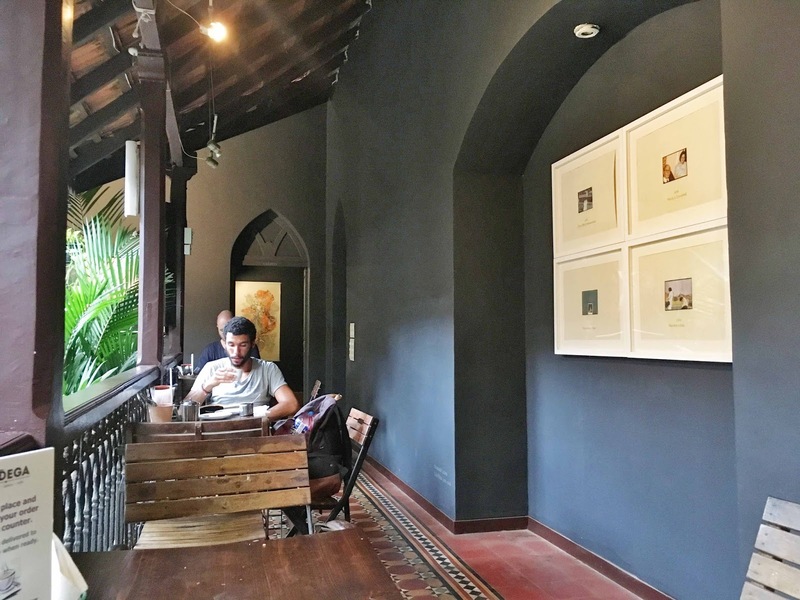 Walking from one to the next, the arched windows and wooden beams leaning in with their own resonances, examining art that was as disparate as the works curated in ‘Sensorium’, can be a distracting affair. The thematic content was so variously presented that it wasn’t always easy to comprehend what each said, and while this certainly brought to light the continuity of diversity, it also compelled a reference to an inner self. 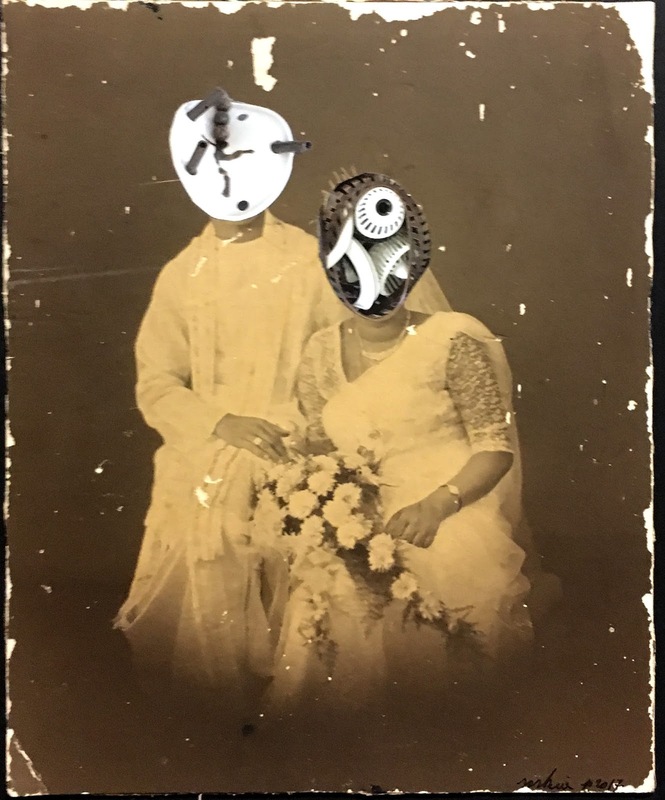 In ‘Hyphenated Lives’, Reena Saini Kallat added a series of question marks, semicolons, colons, commas and in a contiguous dialogue. Resembling zoological or botanical drawings of hybrid creatures that are formed through different species, enjoining to create a variegated kind. (Which our world may well have known, had it not been for Noah’s wisdom of two of each). 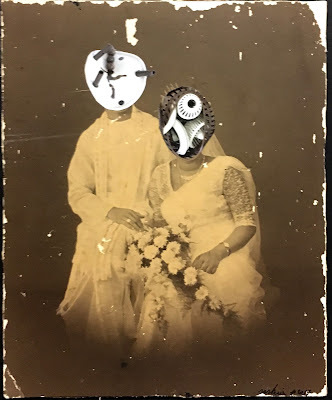 Reena Kallat created curious hybrids primarily using the national symbols of each country, rendering overtones of political reconciliations that could be compelled into being. At the base the quasi botanical drawing, also reminiscent of a postal stamp, of ‘Rosila’ – a cross-breed between a rose and dahlia, she writes in cursive hand informing the type as part rose, wherein “the rose is a woody perennial of the genus Rosa within the family Rosaceae. Its name comes from the Latin word Rosa. A symbol of love and beauty (as well as war and politics) the world over, the rose was designated the official flower and floral emblem of the United State of America in 1986.” She feels that, instead of uniting people from a region, such symbols have become contentious and reason for monopoly, with the original significance being overshadowed. 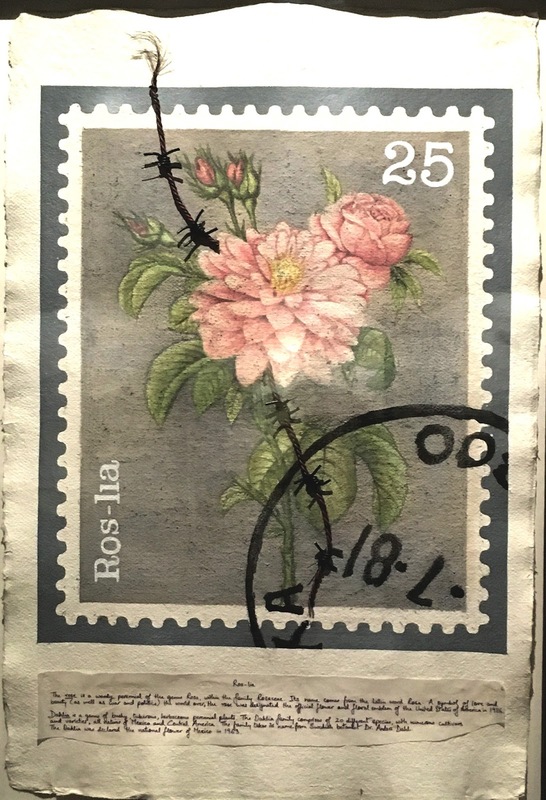 She pairs the rose with the Dalhia, which draws its name from the Swedish botanist Anders Dahl and has been the national flower of Mexico since 1963. Will this genealogical marriage between the universal symbol of love and the “busy, tuberous, herbaceous and perennial” Dahlia, espoused by its contentious neighbour, augur well for the future of human relations? Will the ‘Sun-poe’ formed of the Palestinian sunbird and Israeli Hoopoe become an ambassador of peace between two embattled nations. 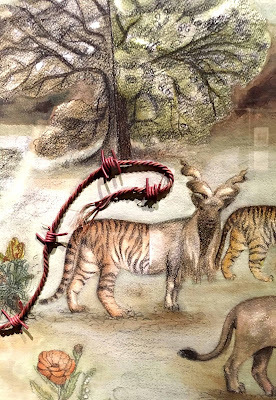 And will the Ti-Khor fused of the Tiger of India and Markhor of Pakistan re-unite a people so bitterly partitioned – the price paid for independence from colonial masters? These interrogations ruminate as the eye takes in the unusual forms these amalgams have birth into. A broken glass will always show its cracked joint and cut pipe ends will never quite weld to be the same length. They can exist as an extension of what once was but there is no turning back. I came away with from this presentation of many voices, humming in unison yet singing in parts, concluding that the continuum of all which is sensory in this world, must mean that whatever the future of the world, whatever form it may or may not take; whether procreation is of same species, or hyphenated in contrived combinations, it is the same energy that breathes that itself into matter formed, re-formed or deformed. Varied and differing in facets of being, but each perfect to its aim.